THE PRIVATE PROPERTY OF THE KHAT'I? The following is my (partial) English translation of another chapter of Georges Charachidzé's remarkable Le système religieux de la Géorgie païenne—Analyse structurale d'une civilisation (Paris: Francois Maspero, 1968; reprinted by La Découverte, 2001). Entitled La communauté religieuse, this chapter describes the system by which the highland tribes of North-eastern Georgia divided farmland in all its forms (fields, meadows, pastures, forests, &c.) into different categories—the primary distinction being between sacred land belonging to their gods (i.e. to the shrine as an institution) and less sacred land for the use of the community. The chapter also explains the processes according to which exchanges existed between the two. Charachidzé notes that he himself found most of this information in various books written by the Georgian ethnographer Vera Bardavelidze, which were published in 1932, 1949, 1957 and 1958. The relationships between the social group and its shrine (men and goods) imply problems of an economic nature which arise from the fact that each clannic divinity possesses movable and immovable wealth. How then is the use of the shrine's lands reconciled with that of those belonging to the clan itself? One can predict that the solution adopted by the Khevsurs will be more complex than that adopted by the Pshavs. As far as the latter are concerned, the exploitation of the sacred fields presents no particular difficulty. The tribe is divided into twelve clans, each possessing a shrine. Every society produces its goods in common, and the fruits of their labours are handed over to the collective group. Diverting a fraction of this energy to benefit the lands of the shrine is a simple matter, since the goods thus produced will, in the end, benefit the entire clan—which functions as a unified religious, social and economic unit. The case is quite similar amoung the other highlanders, except among the Khevsurs. These, as we know, no longer have the traditional form of society which prevails among their neighbours and live in conjugal families, each family farming its individual plot of land. But this change only affects "lay" property, and does not apply to the lands of the shrine itself, which retains all its prerogatives. In other words, Khevsureti distinguishes itself by the coexistence of two systems of exploitation—one "recent" and based upon private work, the other "archaic" and implying collective production. The exploitation of these lands and the manner in which the produce harvested from them is distributed are thus of vital importance for society as a whole, and not only for the shrine. Besides, the Georgian highlanders—and the Khevsurs in particular—operate a clear distinction between the social group made up of all the conjugal families and the religious community. This real separation is clearly known and expressed by the natives [par les indigènes]. A division such as this does not help the system of exchanges between individual families and the shrine. The social, economic, religious unit which intervenes at every level—the "corporate group", as the Anglo-Saxons say—is represented by the sa-q'mo [Georgian საყმო], which translates literally as "for the slaves, which concerns the slaves", from q'ma [G. ყმა], "slave". This notion encompasses all the people living on the lands of the group. They are all the "slaves", q'ma, of the shrine and of its titular divinity. It is upon the saq'mo that the priest calls for the god's protection in most of the liturgical texts. Every khat'i has its own saq'mo. The community of Arkhot'i, for example, worships the Cross of Arkhot'i and refers to itself as the saq'mo of the Cross of Arkhot'i. Its members are the "slaves of the Cross of Arkhot'i". 'In the past there were courts which were set up so as to enable the people to dispense justice itself' (text noted in Khevi, Dial. I, n° 39, p. 40). The notion of erisganni essentially defines itself in opposition to that of khat'ionni; the first category designates all the people who do not belong to the second. This second category encompasses all the shrine's servants, who are themselves divided into two groups: men belonging to the first group devote their entire lives to the god and his cult; they are the kadag, the mk'adre and the priest. The second group only includes temporary auxiliaries, whose service at the shrine lasts only a year or a couple of years at most: they are the dast'urs, the shrine's stewards, who in turn occasionally rely upon specialized helpers (e.g. shepherds, blacksmiths). All the khat'ionni, regardless of rank, are designated by the kadag—from the priest down to the most humble servant. Both categories [of people] are involved in a division of labour and a system of economic exchanges according to methods which we will now briefly describe. The khat'ionni administer the shrine's possessions, or at the very least are responsible for them. The shrine's sacred properties are twofold, the difference residing in their respective origins. A) The "fundamental" lands (unj'i) [G. უნჯი], the lands "under the god's hand". Acording to native traditions, these belong to the shrine for all eternity, as the khat'i, when founding his cult, "placed his hand" upon this territory. They include the "sacred space" [la "place sacrée"] (the shrine and the area immediately around it), the sacred forests and the large plots of cultivated land (khodabuni, "master field" in the secret tongue of the khati) [G. ხოდაბუნი; for the secret language, see this page—A.B.] As a whole, these elements constitute the most revered space, the very area which the kadag himself has circumscribed in the name of the khat'i. B) The lands which the shrine has acquired over time, generally as a result of wars, inheritances or trials [procès]. Their link with the sacred is less strong and less fundamental, but nevertheless involves the khat'i and the men who serve him. The circumstances of their acquisition are the following: we will see that some of them imply an interest which goes beyond local legend. 1. Lands conquered as a result of a war or a vendetta, usually seized from a neighbouring saq'mo. 2. When a man dies without heir, his goods become the property of the shrine and its saq'mo. 3. Lands sentenced to be confiscated by a ruling of the Council, eroba. 4. Lands disputed by two saq'mo (or two families) are often given to the shrine by one of the parties, thus ending the dispute. 5. When a family line or group emigrates, its possessions become the property of the shrine. 6. Lands which the kadag orders to be given to the khat'i—in compensation for a misdeed or in order to heal someone—or which are freely given in order to celebrate a victory, &c.
The modes of appropriation defined in 2 and 5 show that the religious community to some extent stands in for the entire clan [la collectivité clanique]. In regions where the undivided family is the rule—Pshavi, Khevi, Tusheti—the entire clan becomes the owner of disputed lands [parcelles en souffrance]. In cases such as this, the shrine plays the same role, and in a way maintains the unity of the clan. This tendency will be confirmed by certain elements characteristic of the agricultural system practised in Khevsureti. The mode of production adopted varies according to the activity considered and to the perceived religious value of different lands. The shrine, besides the treasury and the "sacred space", owns a forest, pastures, meadows, hayfields, the "master fields", and ordinary farmland. We will operate a distinction between two modes of farming: I) the entire crop belongs to the shrine; II) the crops are split between the shrine and the social group. This classification is purely empirical. a) At the divinity's express orders, communicated by the kadag, all the members of the saq'mo go to the sacred forest in order to cut the wood needed for the construction or the renovation of the shrine's buildings. b) The shrine's stewards, the dast'urs, cut the firewood which will be used to boil the sacred beer (khat'is ludi, "the beer of the khat'i") during clannic religious ceremonies. c) When a family needs wood, it asks the shrine for permission to cut some, and pays a fee [presumably in kind, but Charachidzé does not specify—A.B.] which is added to the shrine's treasury. The main summer pastures are let to foreign tribes. The revenue of this lease is shared out among the different shrines which own the pastures. The price is paid in sheep, which are offered in sacrifice to the clannic god on the day of the religious ceremony [le jour de la solennité religieuse; again, Charachidzé does not specify—A.B.]. All the members of the saq'mo take part in the final banquet, and all of them are given an equal share of the meat. The cattle belonging to the shrine is put out to pasture in the adjoining meadows or taken further afield by the shrine's cowherds. The hay, mown and gathered by the shrine's stewards, is exclusively used to fatten up the animals in winter. The best plots of farmland, which are considered to be the god's private property, are divided into two categories: the khodabuni, "the master fields", and the salude, which literally translates as "for the beer". The grain harvested from these plots is solely reserved for the shrine's use and is destined to provide the bread and the beer for the main religious rituals. These lands are collectively farmed by the entire saq'mo, both the khat'ionni and the erisganni, the latter working under the supervision of the former. The different phases of production give rise to a rigorous specialization. Ploughing and harvesting is the work of the erisganni, the "men of the people"; as these are numerous, they divide up the work, one providing the oxen, another the plough, &c. When the ground is ready, the khutsesi, the priest, sows it. The "great dast'urs" (i.e. the oldest or the most "holy" of the shrine's dast'urs) then harrow the field. The harvest, as mentioned above, is carried out by the erisganni, but once the crop has been harvested, it is the "great dast'urs" who are responsible for stacking the sheaves, threshing and winnowing the grain and storing it in the shrine's granary. The Khevsur also occasionally employ another method. The shrine's farmland is divided up into as many plots as there are households in the saq'mo. Each family uses its own oxen and farming implements to cultivate its plot; the latter is ploughed, sown and harrowed in one day. The grain for sowing is taken from the store in the sacred granary. When the barley is ripe, each family harvests its own plot, ties the sheaves and brings them to the shrine's dast'urs. When these, in turn, have gathered the entire harvest, they thresh and winnow the grain, &c. They then hand it over to the main dast'ur, who is usually entrusted with the conservation of the sacred grain. Before he touches the grain and stores it in the shrine's granary, the latter must undergo a rite of purification. He splashes himself generously with the blood of a specially sacrificed sheep. Only then may he solemly carry the newly harvested grain to the sacred granary. The two following processes (P 6 and P 7) are a sort of transition between [i.] the shrine claiming everything and [ii.] goods being divided between the relgious community and all or a fraction of the social group. According to P 6 and P 7, the goods generated by certain plots of land belong to certain categories of shrine servant, who are entitled to use them for their own personal needs. This thus constitutes an exchange between the religious community and laymen. a) The meadows adjoining and belonging to the shrine are mown by the dast'urs; the hay they gather is theirs to keep and they use it to feed their personal cattle, without anything being required in exchange other than the services they render to the religious community. One should not forget that the dast'urs are not priests, strictly speaking, but instead men external to the khat'i, required by the divinity to carry out a kind of internship [requis par le dieu pour effectuer une sorte de stage] as shrine servants. Their services rendered thus require an exchange in kind: and for this reason is the hay of the sacred meadows theirs to keep. b) At the shrine of Somkho [the shrine of St George of Mt Somkho, G. სომხოს გორის გიორგის სალოცავი, is one of the most revered in Ardoti—A.B. ], the "great dast'urs"—who at this shrine almost amount to auxiliaries of the priest himself—enjoy an additional priviledge: every second year, they are allowed to mow the grass which grows on the "master fields". The Khevsurs practice a biannual form of crop rotation, leaving the land to lie fallow every other year [faisant alterner l'emblavement avec la jachère verte], but even when a crop of sacred barley is not sown, that which grows in the soil of the "master fields" is nonetheless "under the hand of the khat'i" and thus has strong religious value. This is why it is not given to the ordinary dast'urs but instead only to the "great" ones, to those who bear the dignity of high priesthood [qui participent de la dignité sacerdotale]. Like many other peoples around the world, the Georgian highlanders afford the blacksmith [G. მჭედელი] an eminent role in society and ascribe him supernatural powers. For the Pshavs and the Khevsurs, this priviledged situation can be quite easily explained: it is the blacksmith who shapes and makes the cult's principal accessories—cups, goblets, the blade of the sacrificial knife, &c. He also prepares the metal crosses which adorn the divinity's standards and buildings. As the perpetual creator of eminently sacred things, the blacksmith surely maintains a special relationship with the divinity. On the other hand, this phenomenon perhaps led to the fact that it is forbidden to place metal objects in the grave: the promiscuity of the world of the dead would sully the iron of divine origin. The blacksmith is also given the right to use some of the shrine's fields and meadows. These he farms for his own private use. In exchange, he offers his services pro bono to the religious community throughout the year. According to the following three processes, the collective use of the shrine's lands truly benefits all of society. All the shrine's summer pastures are not necessarily let to tenants. Some of them, those most easily accessible, are reserved for the use of the saq'mo: the social group drives its herd—which unites all the animals of each individual family—out to graze upon them. 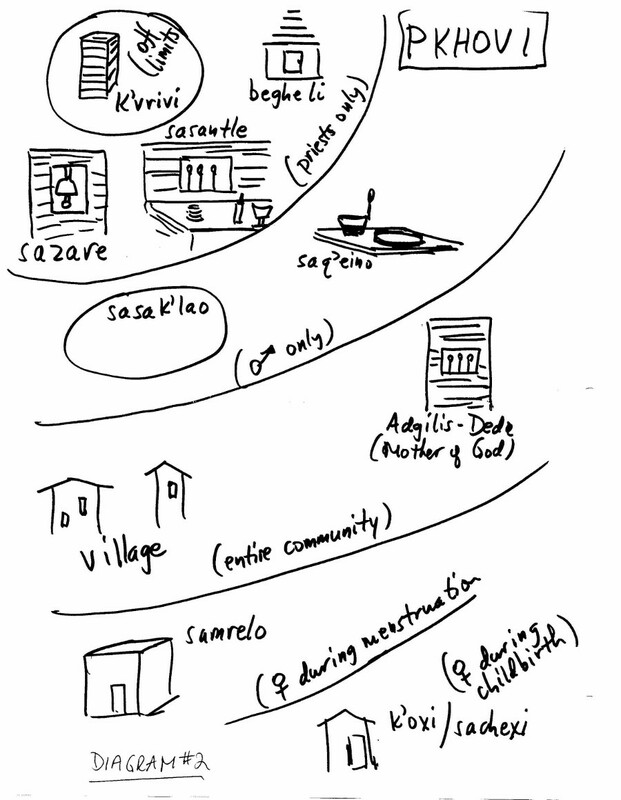 In addition to the "master fields" but also belonging to the shrine, every member of the saq'mo (every conjugal family) receives an additional plot of land to farm. The family farms its plot for a year, then passes it on to another family, and so on until all the families have farmed all the plots of land at their disposal. The entire harvest belongs to the family which temporarily farms the land, except a small fraction of unmilled grain, which every family places in a jar and keeps in the holiest place of the house, where the household god lives [là où réside l'Ange du Lieu, G. ადგილის დედა, adgilis deda, "the mother of the place"], the protector of their home. On the day which marks the feast of the clan's khat'i, this grain is milled, and the flour is used to prepare small cakes [G. ქადა, kada] which every family brings to the shrine. This portion of grain is called zedashe [G. ზედაშე]. Some of the shrine's fields were reserved for the use of the dast'urs; these were referred to as sa-dast'ur-o [G. სადასტურო], "for the dast'urs". The dast'urs in question here, however, are not the "great dast'urs", who were respected as some of the most important members of the shrine's clergy, but instead the anonymous mass of the shrine's servants, who were chosen by drawing lots. Their nomination was valid for a year, and then new lots were drawn from among the members of the saq'mo who had not yet been chosen, and so on until all the men of the social group had spent time serving the shrine. These ["small"] dast'urs farm the plots which the shrine has allocated them. They keep two thirds of the harvest for themselves, the remaining third being used for the shrine's bread, ritual cakes and sacred beer. Prof. Tuite was kind enough to send me this diagram of the spatial organization of a typical Pshav or Khevsur community, represented as concentric circles ranging from the most impure (the miserable k'okhi in which women gave birth, bottom right) to the most holy (the shrine's k'vrivi, top left, which even the priest himself may not approach). Although this diagram does naturally not illustrate precisely what Charachidzé explains above, it is nonetheless an interesting representation of how space was organized.